What an incredible event from beginning to end! 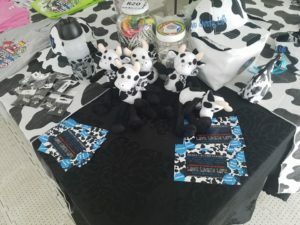 Registration was a huge success with quite a few riders joining the Cows batches and then buying our super cool new design t-shirts and other awesome goodies all brought in from Joburg for this event. 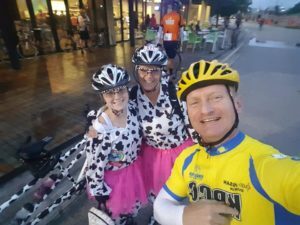 The early start Cows, doing the 100 km were met with a very rainy early morning when they started their race. The first 40km was a bit of a challenge as the nasty nasty M7 tested very cold legs, 15km’s of one long steady hill, with a few short down hills to be rewarded with some more climbing. The Oasis which was the CMH Datsun water station, manned by Cows and CMH staff alike, was a very welcome sight. The super enthusiastic and helpful crew got everyone smiling and on their way. The M19 was a blur of rain and therefore no land speed records were set, but it was exhilarating for every rider. We had cows on tandem getting max speed of 70 but some single bike cows reaching 85!! After a ‘trek’ through busy town sections, the M4 awaited and the distance clanging of cow bells could only mean one thing: The Cows M4 Water Station. Every single rider, be it cow or otherwise was cheered on and welcomed as if they were the event winners. Bells ringing, music playing, lots of y oung and not so young cows attending every rider’s needs, it was superb! This table got loads of compliments from riders and organisers alike as did the M7 station. 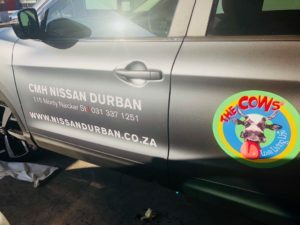 To ride the route and see the official cars zooming past, branded with our Cow logo was another first and super proud moment for the Cows. Thanks to CMH Datsun for making this possible – we can only go bigger and better next year! 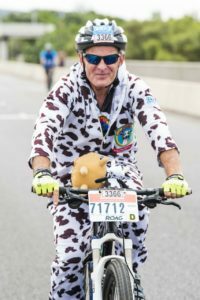 Lots of Cows participated in the 45km event, donning cow suits… even our very own media moo Dave Macleod was not going to brush off the challenge. Very proudly posing with his suit at registration and again at the race!! A true Cow!